I have been a pickling fiend lately. 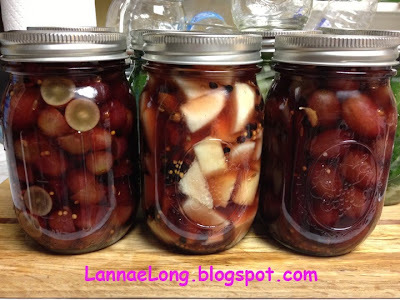 I have made many lacto-fermented pickled goods including garlic dill pickles, garlic dill squash, and kim chi. Now, I learned a new pickle, fresh fruit pickles! I have been experimenting, and I made grape halves, pear, and whole grapes. I like the whole grapes best, and then the 1/2 grapes. The pears were too ripe, and got a little mushy, but they tasted good. I love the spicy grapes, they taste like chutney! Here is how I made them. A couple years ago, I took a few cooking classes with Margot of Margot Cafe in Nashville. I keep taking cooking classes from local chefs in hopes that the classes will make me a better cook. 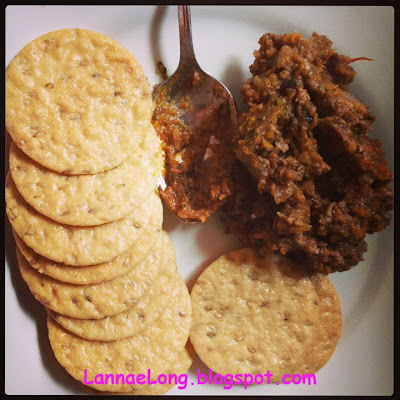 During this class, Margot whipped up a rustic chicken liver pate that was so good. It was livers and veggies, not a fatty creamy variety, rather an Italian fegatini variety of chicken livers. I went home and did not make it for years because I could not get a reliable source of local, free range, well handled chicken livers, but I kept on thinking about this chicken liver dish all this time. Then, I met Wedge Oak Farm. This is family farm located just to east of Nashville. The livestock is well cared for from day one to day last, free range, and heritage breeds. There is so much about Wedge Oak Farm I like and respect that they are my only source of chicken livers. Now that I have an excellent source of chicken livers, I can make this delicious Chicken Fegitini I have thought about for all these years. The Chicken Fegatini recipe can be used in 2 ways. 1st it can be a rustic chicken fegatini and vegetable pate, and the 2nd is to be a chicken fegatini bolognese. Actually the rustic pate has tomato sauce in it, and then adding more tomato sauce makes the bolognese. I love that one recipe is good for multiple uses! Read on and find out. Yes, you read that correctly, I have declared the pickles I made as the Best Pickles EVER! These are real dill pickles made the old fashioned way, they way they were made for generations before we became a germ-a-phobe society. Real dill pickles are made with pro-biotics, beneficial bacteria and time. No vinegar was used, nor water bath canning, these are real dill pickles made by pro-biotic lacto-fermentation. When I was a kid, we lived near a real deliciously awesome Jewish deli. The pickles there were divine, I loved them, I could not get enough of them. 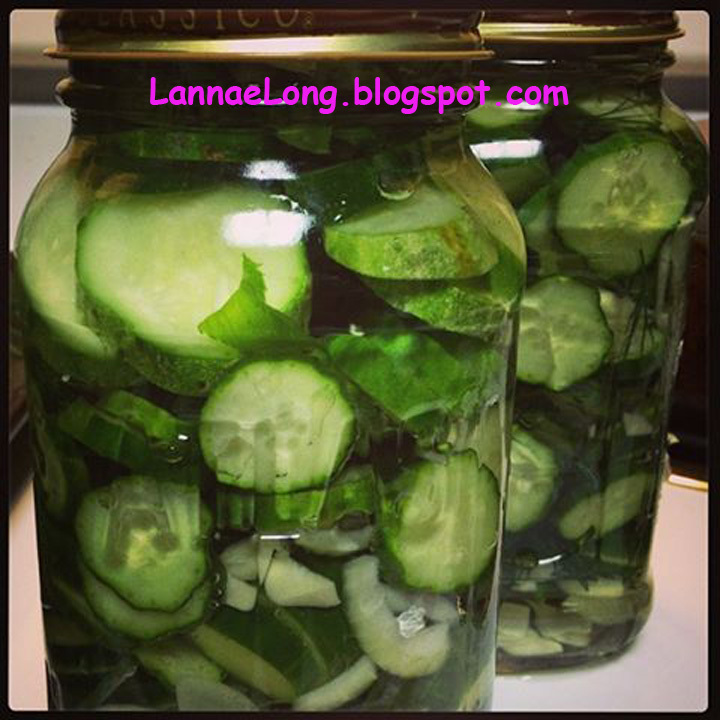 I craved these pickles, They were pickles made by lacto-fermentation, but I did not know that at the time. Then, I remember begging my mom to get pickles for the house from the grocery store. I promised her I would eat them over time, and not waste them. So, she bought jarred pickles from the grocery store made in vinegar and salt. They were not the same as the pickles I craved, they were flat, one note, too vinegary sour, too salty, flabby, and just wrong. So, for decades, I searched for the dill pickle of my youth for decades. And like Dorothy of the Wizard of Oz, I realized all my hopes and heart's desire are right here at home. That is, right here at home, I can easily make my own dill pickles. 1. Get a couple clean glass jars, like old pickle jars or tomato sauce and wash them like regular dishes, no need to sterilize in a water bath. 2. Get 2 lbs of local cucumbers from the farmer's market (non-waxed). Do not use cukes from the grocery store because those are waxed, and it is impossible to remove all the wax without bruising and ruining the cuke. 3. Get a handful of fresh grape leaves or oak leaves by walking through a tree lined neighbor hood. Do not use jarred grape leaves. 4. Get a small onion, couple of garlic cloves, and fresh dill if you can, but dried dill will work too. The process is that the salt water condition enhances the presences of lactobacilli bacteria which makes lactic acid, and the lactic acid then pickles the cucumbers. Lactobacilli is a pro-biotic and quite healthy for you. One word of caution, if mold, bad smell, or badness occurs in your jar, DO NOT EAT IT, throw it out. This is not lacto-fermention it is something bad, and should not be eaten. IF, the liquid is nice and no mold, and the pickles are irresistible, then THAT is lacto-fermentation and you can go ahead and enjoy your pickles. My pickles lasted 2 days in the fridge, and we ate them all.